237 PAGE ARMY COE REPORT leaves parties arguing over what it concludes. The Environmental Protection Agency’s Dallas office released an anticipated study last week of the Alternatives to deal with the Toxic Waste Pits in the San Jacinto River. 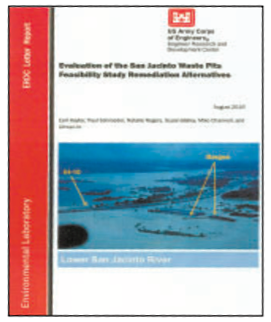 The study report is a 237 page volume, authored by Army Corps of Engineers from their Engineer Research and Development Center in Vicksburg, MS. The work method outlined in the report sets out to resolve 19 “tasks” which deal with methods of remediating the Waste Pit toxins. The study investigates the previously delineated Alternatives, known as 1N through 6N, covering no further action, or various cap-in-place solutions, or partial or total removal from the site. It also adds a 6N*, an enhanced removal plan. The advocacy group known as San Jacinto Citizens Against Pollution, with a website KEEPITCAPPED.ORG, claim that the the report justifies their position to leave the wastes where they are in the river, without removal. Their attorney, Thomas Knickerboker, categorically cites various sections of the report that say capping the site is the safest and most effective option. They also say the report points out that “Dig-and-Haul” poses risks, and that toxic chemicals could leak or be dispersed in the removal process. In the 19 tasks presented in the report, these statements are made. But the complete removal is also recommended as an alternative, if done correctly as outlined in the description. Harris County Sheriff Office Investigators arrested 3 people and seized several weapons and drugs. According to reports, on Wednesday, August 24, 2016, Harris County Sheriff’s Narcotics Investigators raided three homes in the East area of Harris County during a narcotics investigation. These raids were based on a three month investigation, which included undercover officers purchasing large amounts of powder cocaine from two drug dealers who were also associated with the criminal street gang, Barrio Denver Harbor bloods. Deputies served search warrants at homes located at the 7200 block of Waxahachie Street, 7400 block of Tremper Street and 14600 block of Crosshaven Street. Deputies seized 22 weapons, 3 vehicles and over 10 kilos of cocaine, which has an estimated street value of over 1 million dollars.